Scotland is world renowned as the home of golf and the Scottish Borders offers a wonderful location for that golf break you have been planning. With over 20 golf courses in the Scottish Borders plus many more in nearby Edinburgh and the Lothians, there are courses for all standards within easy reach of Jedburgh. At the Glenbank House Hotel, we offer accommodation for golf groups of up to 16 people in our guest bedrooms. Larger groups can be catered for in our Restaurant and Lounge bar, so if your group is larger than 16 people, we can arrange additional accommodation with other local hotels, guest houses or B&Bs while providing a meeting, eating & drinking place for the entire group. 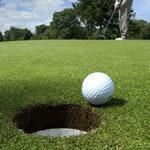 Contact us to discuss your plans – our aim is for you to make the most of your golf break in the Scottish Borders. The Glenbank House Hotel’s Lounge Bar – make it your 19th hole!